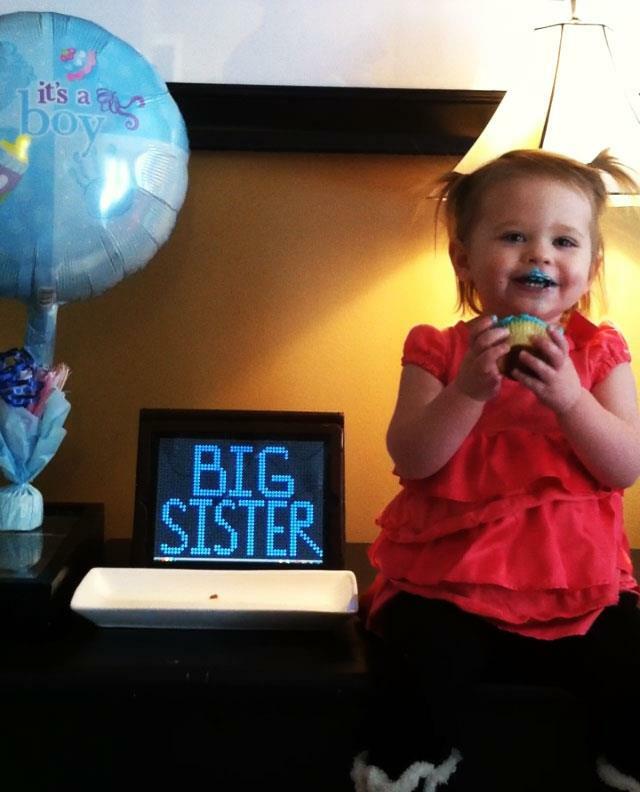 Emma’s going to be a big sister to a baby BROTHER! First, an important announcement! I had my 20 week ultrasound last week and found out that Baby Tress is a BOY! I could not be more excited! I can’t wait to give birth to my little athlete. Ah … weight gain during pregnancy. A very hot topic, but one that is hard to discuss. Today I hit the 21 week mark, and I have gained nearly 11 pounds of baby weight! With my first pregnancy, I was obsessed with the numbers on the scale. I actually purchased a scale in the first trimester, just so I could track my weight gain during pregnancy and be sure that I was gaining enough, but not too much. I wrote about weight gain during my first pregnancy in the following posts. Read them for more information on weight gain during pregnancy and to hear what other women experienced as well. How Much Weight Should I Gain — 1 lb per week? 21 weeks pregnant and past the 10 lb weight gain mark. Really poking out now! This pregnancy I have been much more laid back about my weight gain. I started off at a healthier BMI pre-pregnancy (about 5 lbs heavier that with my first pregnancy). As a result, my weight gain was slower in the first trimester this time around. In fact, I likely only gained about 1 or 2 lbs versus the 3-5 lbs that I gained in the first trimester of my first pregnancy. 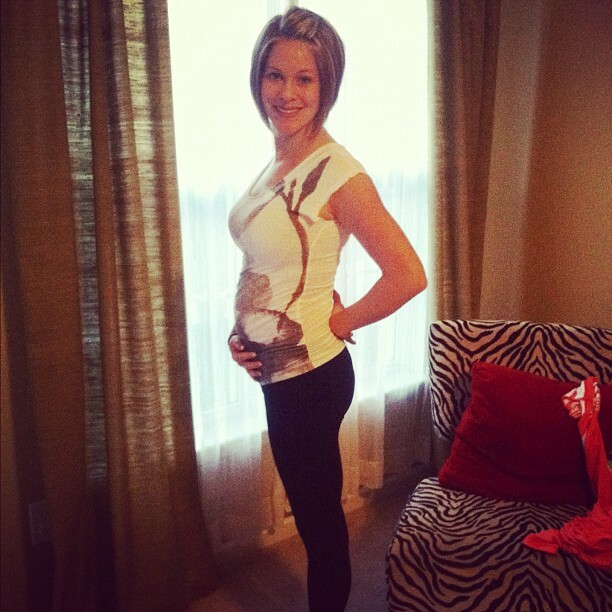 When I was pregnant with Emma, I was famished in my second trimester. This time, I am staying fairly faithful to the Paleo lifestyle. I am still a lot more hungry than usual, but not famished! With Emma, I gained about 10 pounds between weeks 15-20. This time, I just passed the 10 pound mark, and I am 21 weeks pregnant. So. I like only gained about 8 lbs in weeks 15-20. It appears that I am still on track for the healthy 25-28 lb weight gain during this pregnancy. Only time will tell! One fear of mine is that I will get the “pregnant lady nose” that is often the trademark of women pregnant with boys. I plan to try to prevent my nose from swelling by continuing to exercise (thus increasing my circulation) and drinking TONS of water. Still — being pregnant in the middle of the summer again will not help. We’ll see how the nose does. HA! How much weight did you gain during your pregnancy? Was it more or less the second time around? pregnant lady nose? really?! I have NEVER heard of this… please explain! well, I’m glad to have the head’s up 🙂 so many things to learn! certainly my face was a little more round but the nose was normal when carrying Pierce. I gained 23ish lbs but went 10 days early. I was on bed rest from week 32 to 37. My 37th week I walked 50 miles and jumped on a tramp for close to an hour the night before I had him! Oh and I had to stop running at 20 something weeks due to contracting every time I tried it. Oh my gosh — I would die! That’s so scary though! Do they know what was causing the contractions? I have Braxton Hicks when I workout, but not real contractions — thankfully. Although my Braxton Hicks are fairly painful. Only been preggo once and gained 32lbs. However, I lost 20 of that in the hospital (Em was 8lb 14oz). She was also 8 days early so thank God she was early haha. I gained 27lbs with baby #1 and 23lbs with baby #2. Surprisingly, I lost the baby weight in 6 weeks the first time but 12 weeks the second time. Either way, I’m not complaining. It was the getting back in shape that was difficult! Your blog is such an inspiration! I delivered my second child last week. I worked out up until delivery and gained less this pregnancy then my first which was 20 months ago. Reading your blog inspired me to keep working out until the end! Congrats on the new addition to your family Andrea 🙂 Thanks so much for reading, and I’m SO GLAD to hear that you worked out up until you delivered. AWESOME job! Great blog! Thanks for your work! I have a question about the weight gain. Before I got pregnant, I was working out 4 times a week doing intense cardio and Cross Fit. However, in my first trimester I was so sick all of the time that I ended up losing 11 lbs (I think some of that was muscle). I am almost 23 weeks and have gained back the 11 plus an extra 2 lbs (compared to what I weighed pre-pregnancy). What should my starting point be for tracking my weight gain? Should I start at what I weighed before I got pregnant? Or should I track from my lowest weight during my first trimester?